We have expected for some time now that there would be a higher performance version of the new SRT Viper but today, the internet has been abuzz with the new 2013 SRT Viper TA – a special Time Attack version of the 640 horsepower Mopar supercar. Meet the 2013 SRT Viper TA – a specially prepped, limited edition version of the 2013 Viper that combines standard and optional features from the base Viper and the Viper GTS to create the best performing model of the current SRT lineup. While Mopar fans will recognize the TA moniker in association with the Trans America racing of the 1970s (like the Dodge Challenger T/A), the TA attached to the new Viper stands for Time Attack. This model is designed to sit between the base Viper and the Viper GTS with all of the items needed to make the Viper TA go fast but none of the non-essential features of the Viper GTS that drive up the price – and the weight – of this modern supercar. The 2013 SRT Viper TA begins on the outside where the optional carbon fiber aero package from the Viper GTS is standard, adding a carbon fiber two way splitter up front and a low profile carbon fiber spoiler out back – a spoiler that provides a whopping 300 pounds of downforce at 150 miles per hour. Next, the matte black wheels of the Track Package are added, wrapped in the same Pirelli tires as are found on the Viper GTS. Finally, the Crusher Orange exterior paint is accented by the carbon fiber taillight panel that is spread across the back end of this great looking supercar while new TA decals on the front fenders complete this high performance, low volume package. Under the hood, the 8.4L V10 from the 2013 SRT Viper and Viper GTS remains unchanged with 640 horsepower and 600lb-ft of torque but to reduce the weight, SRT has removed the aluminum engine cross brace to make room for a similar unit made out of carbon fiber that weighs 2 pounds less than the standard piece. Where the SRT Viper TA really shines in terms of performance is in the heavily revised braking and suspension system. The Viper TA makes use of the same dual mode adaptive suspension package that is standard in the Viper GTS but where the GTS has Track and Street modes – the Viper TA has two different Track modes with varying levels of race ready performance. In addition to the special adaptive dampers, the Viper TA comes with uniquely tuned springs and anti-roll bars to further improve the handling of the new SRT supercar. Next, the Viper TA features a braking setup similar to the one included in the Track Package but the Stop Tech two piece front discs have been replaced by Brembo rotors that are 5 millimeters larger than the Stop Tech units while also being twice as thick – better protecting from loss of braking force through the rigors of track time. There are also new Brembo rotors out back that are the same dimensions as the Stop Tech units. Many people in the high performance Mopar world expected that when the Chrysler Group rolled out a higher performance 2013 SRT Viper to reclaim the Laguna Seca title, it would be named the Viper American Club Racer (ACR). The new Viper TA closely follows the design theory behind the 2010 Dodge Viper ACR that set records around the world with a focus on weight reduction and handling modifications rather than adding more power. This is pretty much what we expected from a new SRT Viper ACR but what we did not expect was for this new track-purposed Viper was to stick with the heavy-ish adaptive suspension setup of the GTS. The Viper TA has maintained the dual mode suspension system from the Viper GTS while also including an even heavier braking system but the SRT engineers were able to include this new braking setup and high tech suspension rig while still making the Viper TA lighter than the base Viper. More importantly, the Viper TA is also lighter than the Chevrolet Corvette ZR1. When the folks at Motor Trend recently tested the new SRT Viper TA, it had a weight of 3,332 pounds compared to the base Viper at 3,343lbs, the Viper GTS at 3,357lbs and the Corvette ZR1 at 3,344lbs. Combined with the revised braking and suspension setup, the Viper TA was able to reclaim the Viper’s record at Laguna Seca Raceway with the help of Randy Pobst. Pobst was the same driver who tested the 2013 Viper GTS head to head with the Corvette ZR1 when the supercharged Vette beat the new GTS while also breaking the track record set by the 2010 Viper ACR. The Viper TA turned a lap around Laguna Seca of 1:33.62 which is only eight hundredths of a second faster than the Corvette ZR1s best time of 1:33.70 – but faster is faster no matter the size of the gap. In addition to being quicker than both the Viper GTS and the Corvette ZR1 around Laguna Seca, Motor Trend found that the Viper TA out-dashed the Corvette ZR1 to 60 miles per hour in just 3.3 seconds (the Vette takes 3.4 seconds) while also roaring through the quarter mile in 11.3 seconds to the ZR1s time of 11.4. Again - not huge gaps - but enough to reclaim the bragging rights. Chrysler will build 33 examples of the 2013 SRT Viper TA beginning around September and all 33 copies of the TA will be painted Crusher Orange. The Viper TA will carry a price of $120,500 - putting it between the base Viper and the Viper GTS – but with only 33 examples being built, we have to question what kind of dealership markup we might see applied to this new record setting supercar. Luckily, the Chrysler Group plans to build and sell more Viper Time Attack models in 2014 but they will only be available in black or white. 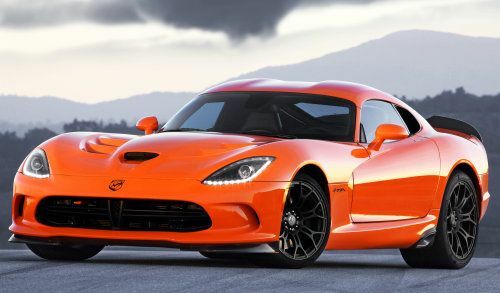 Update: The Chrysler Group has issued official images of the new 2014 SRT Viper TA in the striking Crusher Orange scheme. Click any of the thumbnails on this page for a closer look at the new Viper Time Attack package.